Banco Agricola - PROJECT - FOSHAN LEADEX FURNITURE CO.,LTD. Our goal is to build an open and bright space to enlighten our clients with our undisguised and motivated working atmosphere. Address：San Salvador San Salvador, Paseo General Escalón y 69 Av. Sur No. 3635, Colonia Escalón S.S.
Introduction: Banco Agricola(abbreviation as BA below) is the best ally of micro miniature enterprise, offers customized made full-scale financial products and services. Banco Agricola is part of Bancolombia group and we are oriented to be the most humanization bank. Based requirement: BA is a financial Latin American group that supports people´s dreams and seeks to establish with them long lasting relationships, based on trust, intimacy, respect, tolerance, and warmth. Our goal is to build an open and bright space to enlighten our clients with our undisguised and motivated working atmosphere. When BA re-planed its office, they found Leadex. *Leadex offered a design with MDS series long bench. The main tune is soft earth color, the desk screen is blue color as their company logo. *Option 2: Table tops and cabinets used more bright wood grain color, and desk screen with clear glass. *Option 3: Changed the tops and cabinets into white color, and desk screen with frosted glass. BA was very happy with option 3. As it is bright, active, and the atmosphere is soft. New questions to BA people—shall we use floor screen or desk screen? Shall we use clear glass or frosted glass? Leadex shown different effects by photos, and gave suggestions. *Photo left is with floor screen, photo right is with desk screen. From the photo, they found that with desk screen was more visual, with frosted glass increasing the necessary privacy. 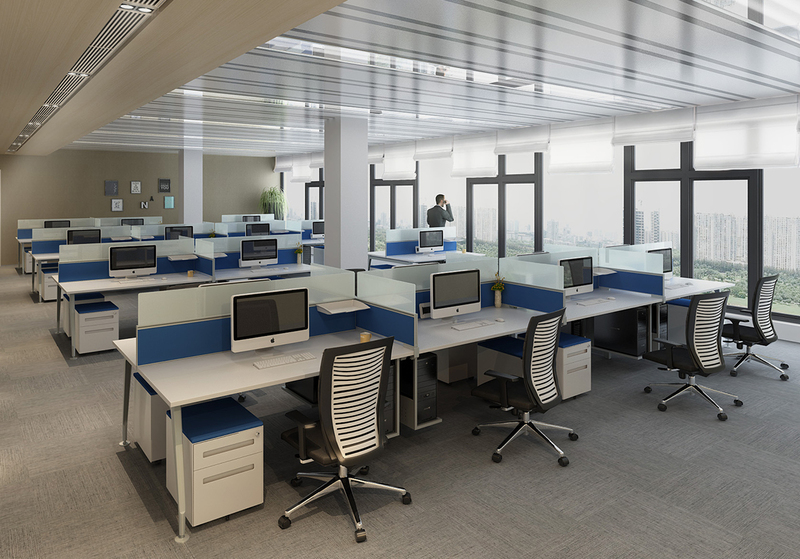 Definitely, desk screen with frosted glass fit their requirement. BA gave a challenging to Leadex: they want the workstation benches continuous and no stopping even there are concrete column in between. So Leadex had to adjust the plan according to these concrete column positions. For these column positions, Leadex designed a special telescopic beam—it was impossible to get the exact size of the beam until you assembling it at site. For the company with more than 300 staff, this special column solution means maximum using of the space. 1. Leadex offered power docks with UL certificate. The power docks are integrated with sockets, telephone and data access. It supports a very convenient access to technology. 2. Considering large data processing requirement in the financial service, we offered CAT6 data access in the power dock that allowed the data transport much faster. That is out of BA’s expectation and make them happy. 3. Each workstation is coming with hanging accessories. It increases the working space and working efficiency. 4. Each pedestal is coming with cushion, and it encourages unofficially communication. We believe that providing the best product and service is the only way to satisfy our customers. So we supervise every step of the lifecycle of our product: design, production, delivery, assembling, etc. Leadex supplies the basic office equipments, that helps the enterprise to build their office space, and maximizes their work efficiency. Our creative and thoughtful designs will not only best utilize the use of space, but also make the office space a home for every employee. Copyright © 2016 FOSHAN LEADEX FURNITURE CO., LTD.